Chanel N°5 L'Eau is a natural and fresh reinvention of the original Chanel N°5 with top notes of lemon, mandarin and orange that soar skyward with aldehydes; heart notes of rose meld with airy jasmine and an ultra-modern fraction of ylang-ylang; and base notes of vetiver and cedar impart a novel dynamism, softened by notes of musk. 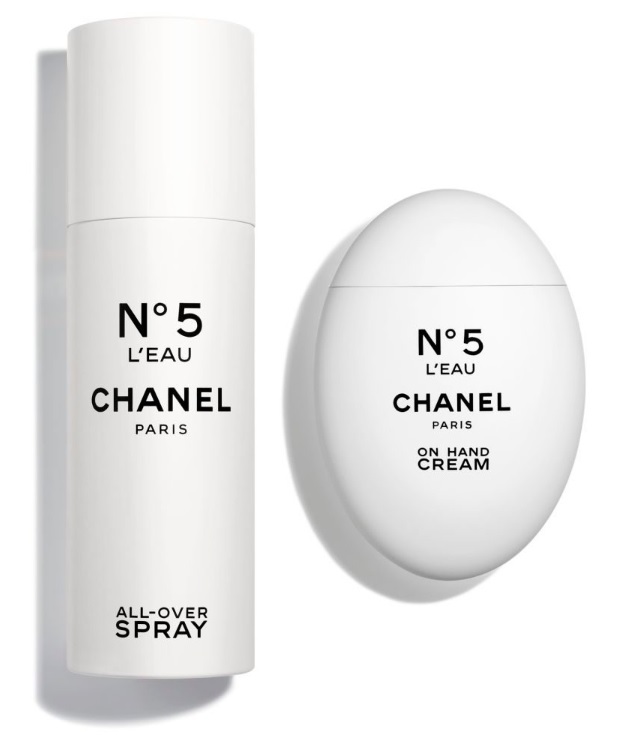 N°5 L’Eau All-Over Spray - 150ml - $75 - with a lower concentration of alcohol to bring out the freshest facet of N°5 L’Eau, it's a perfuming spray for the hair and body in sleek packaging that is very travel-friendly. N°5 L’Eau On Hand Cream - 50ml - $70 - a sensual and enveloping cream that can be used on hand and body and layered with fragrance for longer lasting scent in fun packaging that makes it super easy to find in your purse. Available now at Chanel counters across Canada.